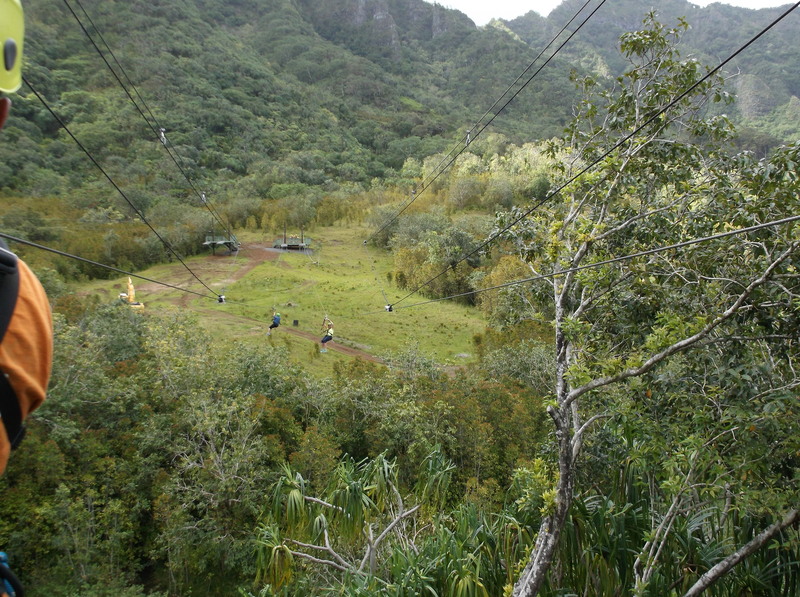 When I go somewhere for an adventure I like to include a zip line tour. 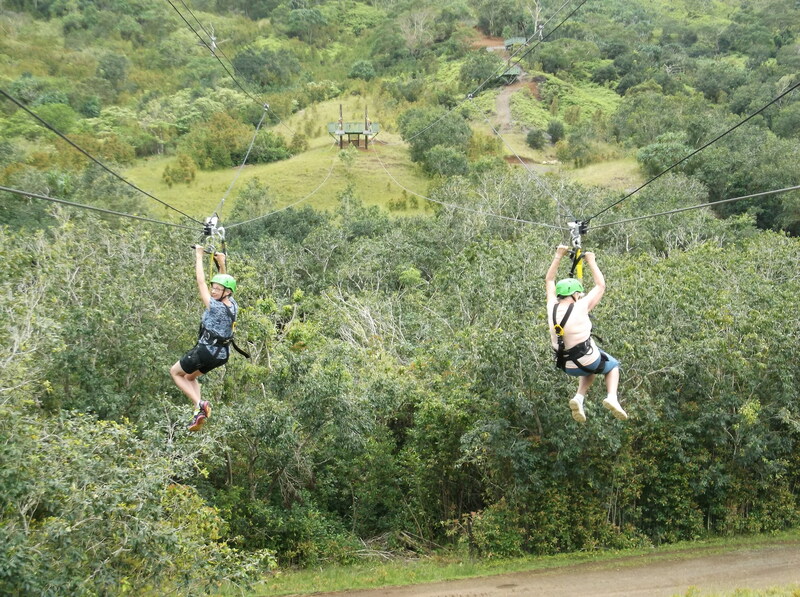 Ever since my first experience in South Africa, hitting the zip line has been on the agenda. 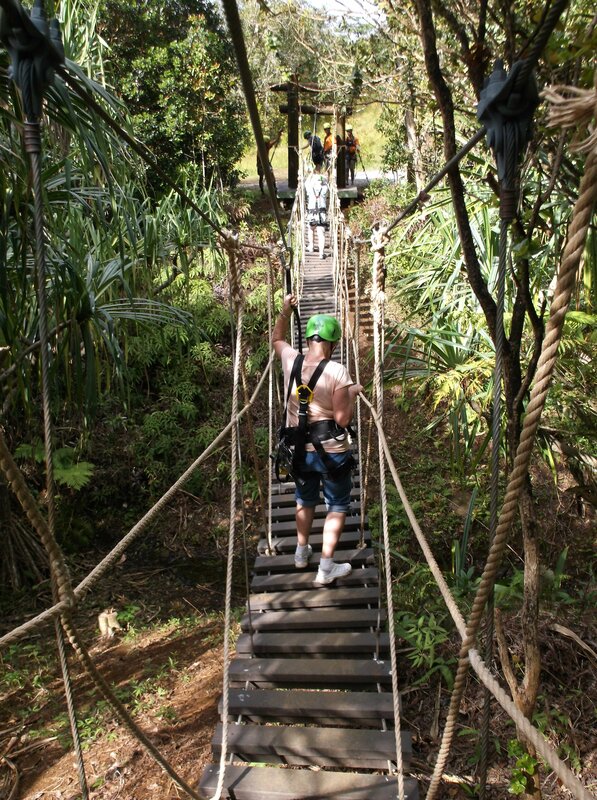 We have also enjoyed zip lining in Ketchikan, Alaska, Chiang Mai, Thailand, Pennsylvania, and now I can add Hawaii to the list. 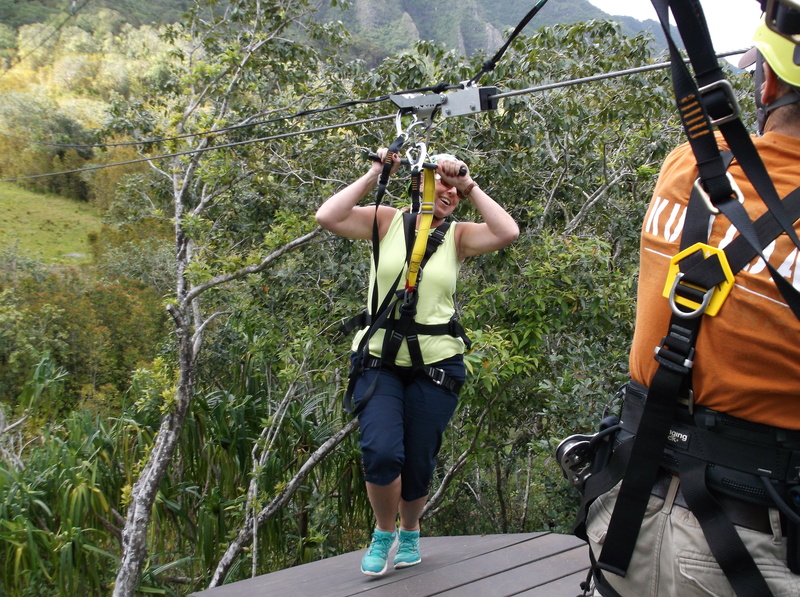 I have found zip lining offers a lot more than just sailing along on top of trees. In South Africa the tour included a bumpy uphill ride on the back of a beat up pick up truck. In Chiang Mai we enjoyed a long bus ride through town and country and deep into a forest that was once a tea plantation. Alaska offered a switchback, up hill hike through the forest. 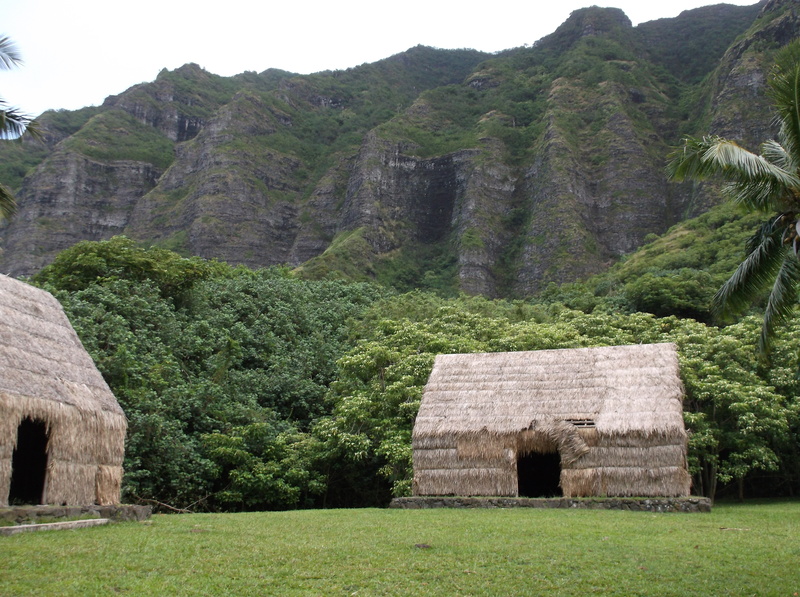 In Hawaii we had a tour through the Kualoa Farm seeing backdrops where movies and TV shows were filmed. 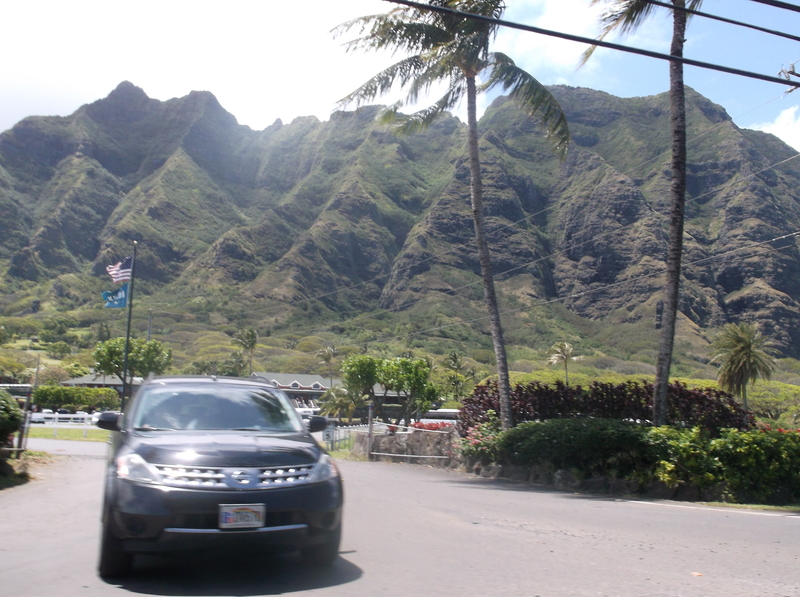 The driver acted like a tour guide and gave us much history of the grounds. The drive up is amazing. 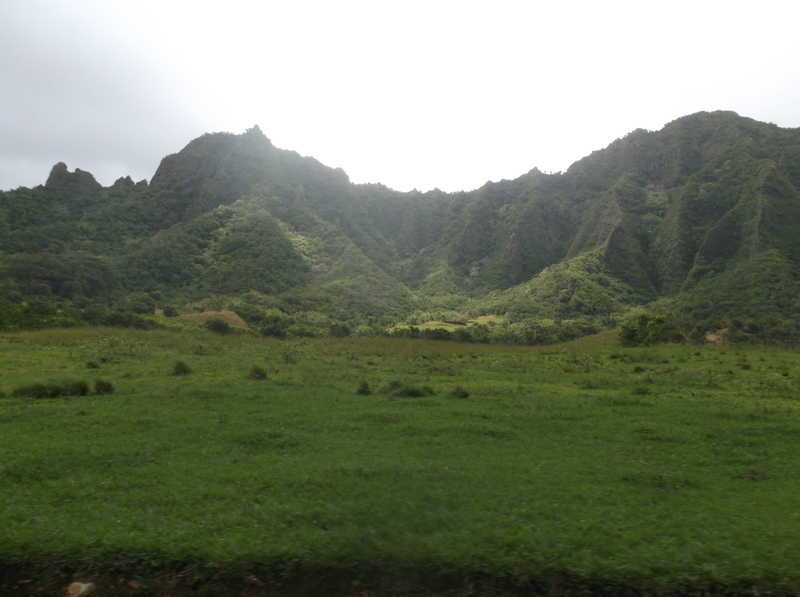 I love these, what I call, velvet rippled mountains of the Windward Side. This is the place. 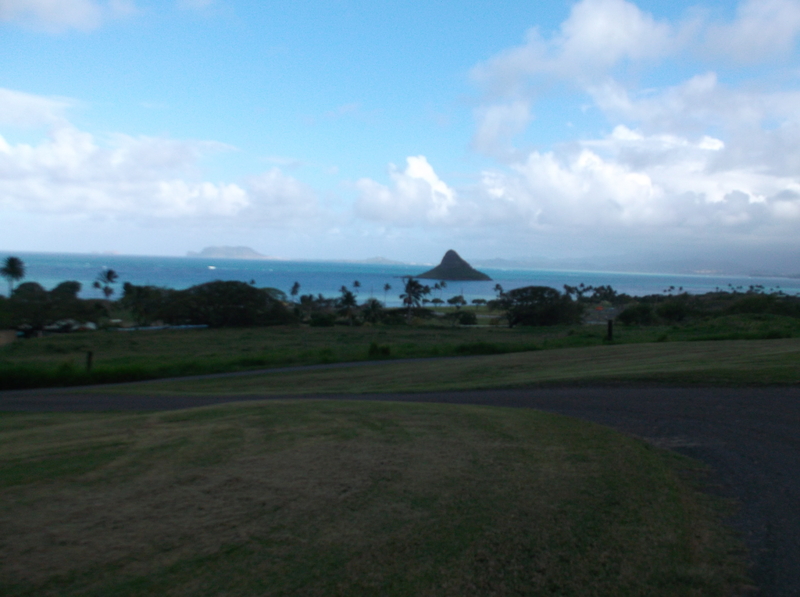 Four thousand acres of Hawaiian play land, from horse back riding to four wheeling and of course, the zip line. There are many other adventures to enjoy on this farm, but we had one thing in mind. 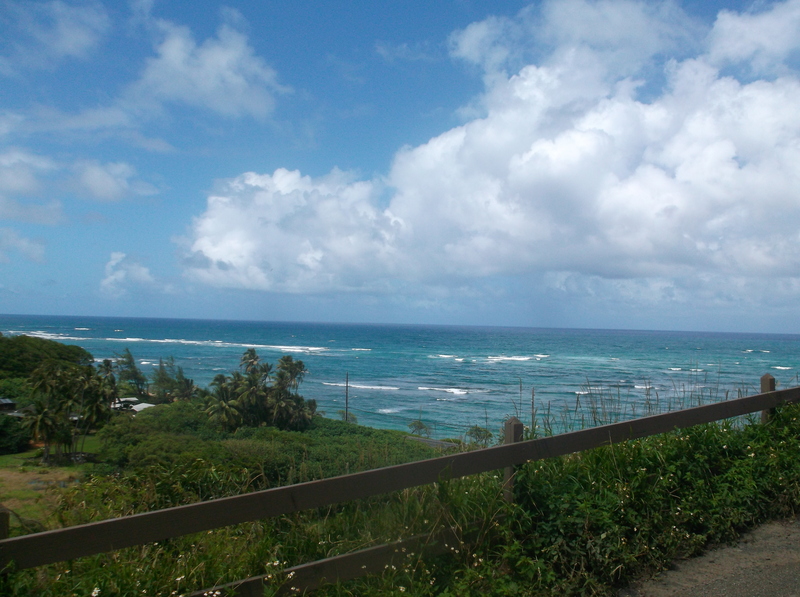 So we jump on the bus and enjoy the scenery on the way up with ocean views nearby. 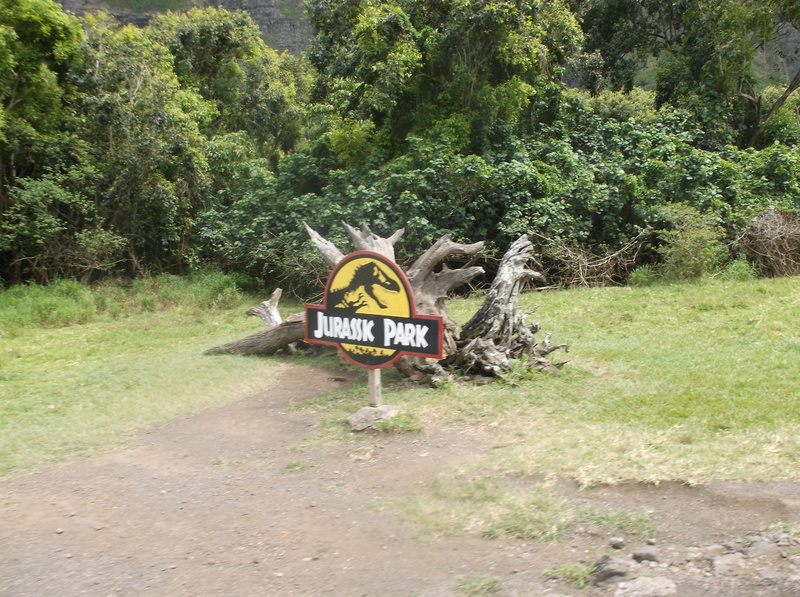 Right through the Jurassik Park movie set and TV’s Lost series. We are finally there and now the adventure of suiting up begins. 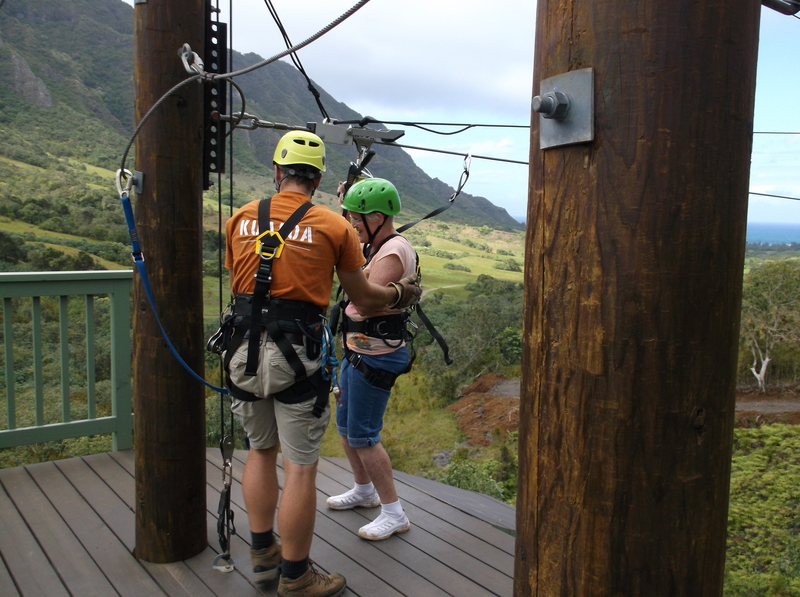 Adding to the fun is going with someone who has never gone zip lining before. The girls were nervous, but after the second out of seven lines, they were pros and enjoyed the day as much as I did. 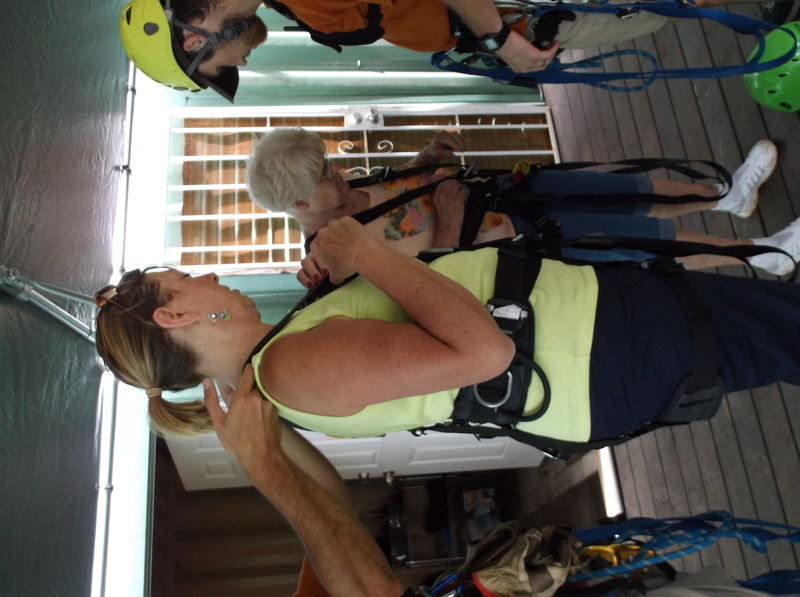 You pack your own chute, but it is checked by three different experts. Put me in coach, I’m ready to fly! Not as high as some I have been on, but fun none the less. The tedious bridge walk. Thank goodness for the harness. Thank goodness I didn’t fall. Dee comes in for a smooth landing. 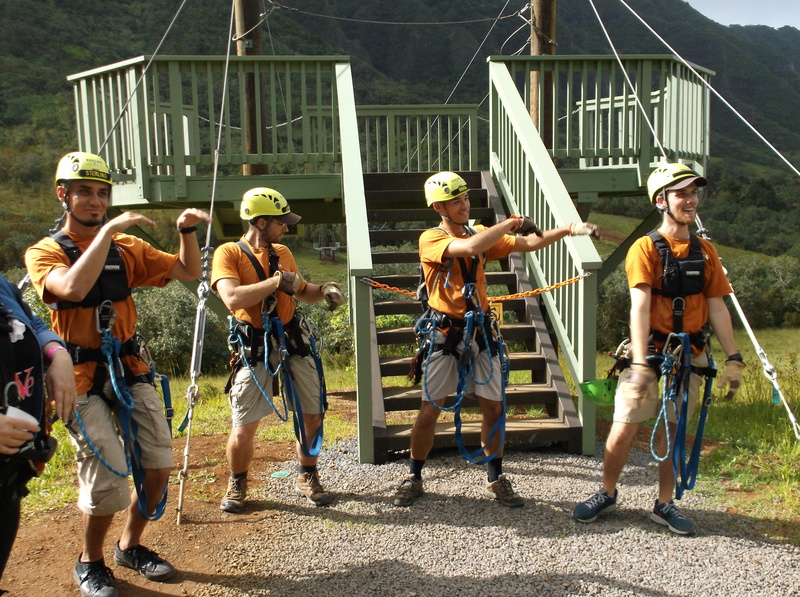 The guides entertain us with a hula dance, after all what’s a zip line in Hawaii without a hula. The guys were great fun and helpful. We had another diversion about half way through the lines. One of the men in our group, who was standing beside me, fainted on the deck. He was clutching the railing and went out cold. A near by guide unhooked himself from the line, came over and helped me get him down. I grabbed the guide’s discarded helmet and started to fan him and he came around quickly. Pretty scary as he was white as a sheet and sweating profusely. Thankfully no chest pain involved. They came and got him in a pick up truck. Turned out he was dehydrated and was fine when we saw him again at base. His wife said “By honey, I’ll see you when we’re finished,” and away we went on the next line. 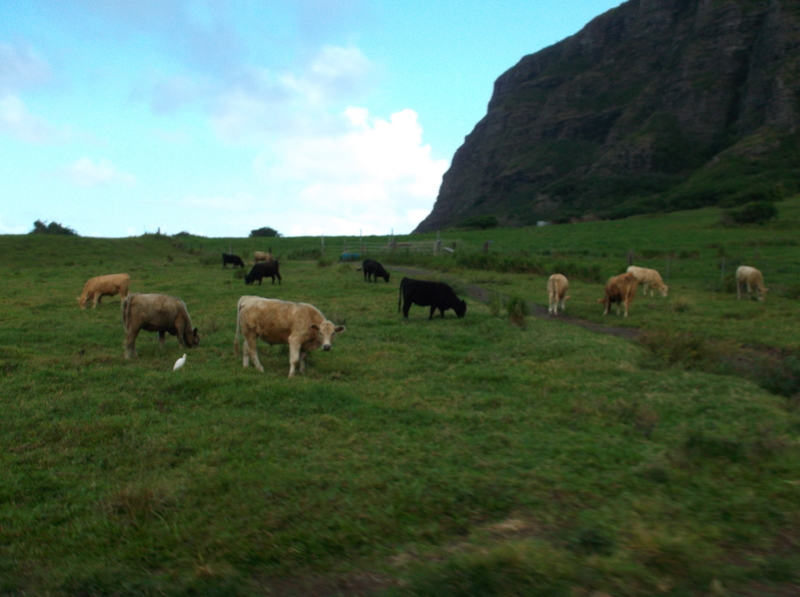 Some scenes on the way back down to base were the proverbial “Little grass shack,” and the contented cows grazing in paradise. 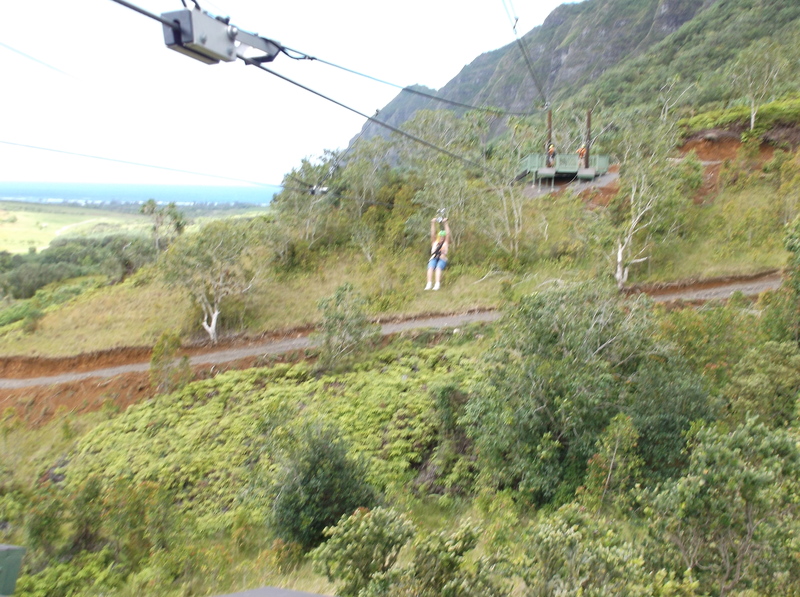 This was definitely a doable zip line in a beautiful setting. 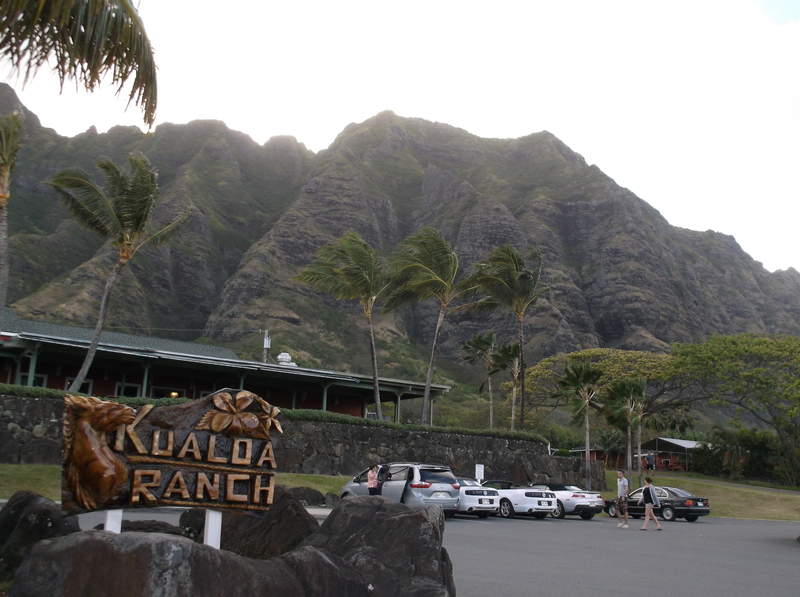 Not as scary as the “sky high” one in Alaska and not as exotic as the 32 line “Flight of the Gibbon” in Chiang Mai, but Kualoa has my vote for being user friendly for first timers.